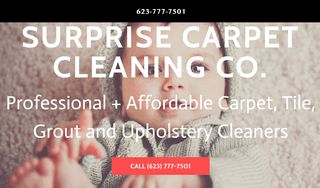 We're the top carpet cleaners in Surprise, AZ. Specializing in carpet, upholstery, tile and grout cleaning-- we use the best equipment in the industry to provide you with spotless floors that are pure and fresh, improving your environment and keeping you and your family as healthy as can be. Facebook : Surprise Carpet Cleaning Co.
Instagram : Surprise Carpet Cleaning Co.